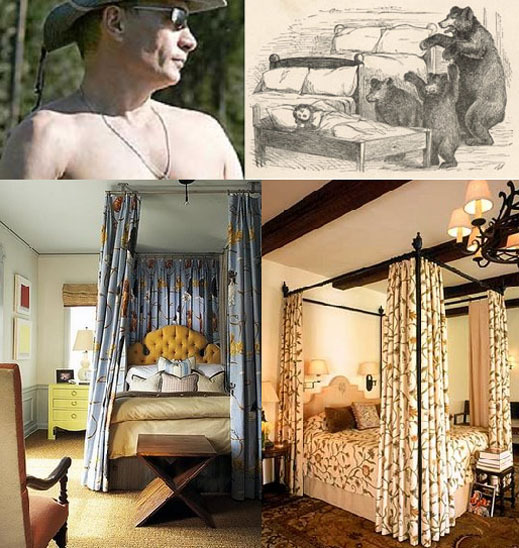 THE THREE BEARS, ITALIAN STYLE — GOLDILOCKS MEETS BERL, AND WHO’S THAT SLEEPING IN PUTIN’S BED? Silvio Berlusconi, the Prime Minister of Italy, has named a bed in his Roman home, Palazzo Grazioli, after the Prime Minister of Russia, Vladimir Putin, according to a conversation Berlusconi had last November with a young lady he was inviting to join him in the bed. The bed itself is described as having curtains. The house belongs to a family of grain-grinders and bakers, who took cash from the ladies they married and invested it in land that grew the grain they used to mill and bake. They did well, and celebrated by buying the house, which they then redecorated in the 1860s. Berlusconi doesn’t own the house; he rents an apartment inside. But he does own the bed. That is because Berlusconi claims Putin presented it as a gift. According to a purported tape, transcribed excerpts of which have been published this week by two Italian newspapers, Berlusconi is very proud of Putin’s gift. To protect the bed, Berlusconi explains to his lady friend that the two of them should have separate cleansing showers before meeting on the mattress. It has not been disclosed how long their meeting lasted, although a subsequent conversation between the lady and a friend alleges the meeting lasted all night. It is not known whether the curtains were closed. The lady alleges that she was not paid for her time, but received an ornament as a memento. A turtle, she claims. Berlusconi’s spokesman claims the tape-recording of the meeting, and the conversational detail, are fabrications. The spokesman of the Russian Prime Ministry requested a fax setting out the request for verifying the provenance of the bed. The spokesman for the spokesman, Alexander Smirov, replied that he is on a business trip, and his deputies are unavailable. “We can’t give you the answer today”, she concluded.